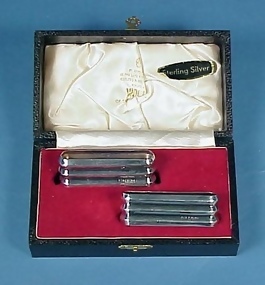 Very nice pair of sterling silver napkin rings in their original silk- and velvet-lined fitted box. The inside lid of the box is embossed with the mark "Viner's of Sheffield By Appointment To The Late King George V". Each napkin ring is fully hallmarked for Sheffield, England, 1966. Condition: mint. Size: 2-3/8" x 11/16" x 3/4".